Built between the spring and autumn of 1899, Plymouth Cordage Mill #2 was built by the Plymouth Cordage Company, one of the leading rope manufacturers in the world, to be the backbone of its ropemaking facility. The 300,000 square foot building was constructed in many ways similarly to other mill buildings from the time period – brick exterior walls (made on site), southern yellow pine structural timbers, decking and roof, and granite sills and foundation. The building also featured some unique elements – structural beams were spaced 5' on center which is exceptionally dense for this type of building, and where beams met columns, a 4-way mechanical joint locked them into the column pintle for extra strength. The building even featured an air conditioning system, where cool air from underground tunnels was pumped with large rotary compressors through specially designed shafts in the east wall of the building. Items like these, combined with the exceptional quality of the timber, underscores the expense that went into constructing Mill #2, the importance of the ropemaking industry in general and the global importance of the Plymouth Cordage Company. All aspects of ropemaking took place inside Mill #2, from treating the hemp with mineral oils (and at one point, possibly whale oil) to condition the fibers, to spinning and braiding the final products. Although Plymouth Cordage Company was founded to service the maritime trades, the mills soon found a second purpose in manufacturing baling twine for the soaring domestic agriculture industry. With Plymouth Harbor frontage and a connection to the Old Colony Railway, Mill #2 was a vital center of industry well into the 20th century. The complex was sold in 1964, and although it survived for several years under different ownerships, Mill #2 was eventually boarded up and remained vacant for the better part of 20 years. In the summer of 2008, prompted by engineering reports that the years and salt air were compromising the integrity of the Mill's brick walls, the ownership group had to seriously consider that Mill #2 may not realistically have a place in the future site development. By demolishing this structure, they would be able to reduce the tax burden on the property, eliminate costly maintenance and the risk of vandalism or fire, and ultimately avoid the inevitability of structural collapse. When touring Mill #2 to develop a demolition estimate and plan, a unique problem arose. Although the antique lumber that comprised the structural framework of the mill indeed appeared to be of exceptional quality and quantity, it was also extremely oily. While most mills contain some amount of oily wood as a reminder of the industrial past of the structures, the whale and/or mineral oil treatments for the hemp fibers seemed to have excessively stained the wood – soaking through decking, beams, and even down onto the columns. As such, we prepared for the possibility that the majority of the wood would not be suitable for reuse. It quickly became obvious that traditional disposal through debris processing facilities, and the substantial financial burden it would represent, would never meet the budgetary needs of this project. We began immediately making plans to find an alternative to traditional disposal for this large quantity (7,500 tons) of source-separable wood material, and bio-fuel became the obvious answer. Through our partnerships with the recycling and demolition debris processing organizations in the region, we've refined techniques to create a high quality single-source material stream that can bypass many of the processing stages on its' way to becoming bio-fuel feedstock. We decided to take the next step on this project and manufacture on site a boiler-ready bio-fuel product, based on wood fuel specifications developed collaboratively between US producers and consumers of bio-fuel products. Many of the techniques used on this project were part of our standard operating procedures for demolition material handling; use of high precision, rotary attachments on hydraulic excavators, skid steers with grapple buckets, and on-the-ground labor to separate building components into high-quality, consistent material streams – saleable antique lumber and architectural salvage, clean wood suitable for recycling or reuse as bio-fuel, metals sorted by type and grade, painted and unpainted asphalt, brick and concrete, and non- or difficult to recycle building materials like insulation and roofing. Added to our fleet of equipment for use on this project was newly-acquired wood processing equipment by Doppstadt consisting of a slow-speed primary shredder, high-speed secondary grinder, rotary trommel mill and a grapple/magnet equipped Sennebogen material handler. 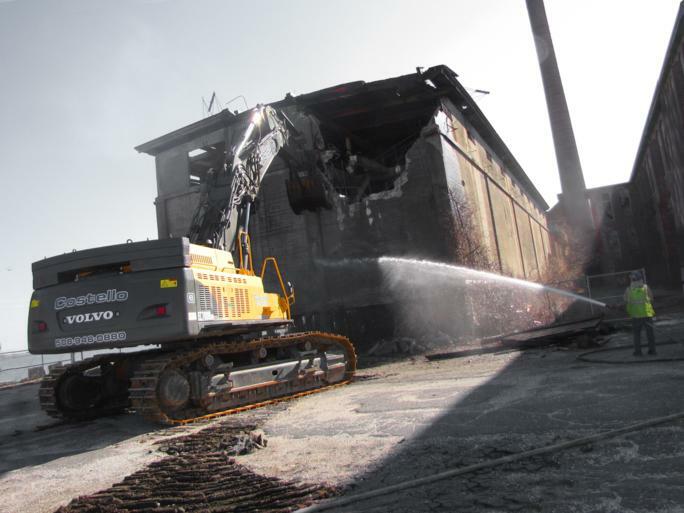 One of the key components to transforming a demolition site into a fuel manufacturing site is to have appropriate staging ground for the materials to reduce the risk of contamination by dirt, metals, or other foreign materials. For this project, we retained the original 3” thick wooden basement floor for use as a wood preparation surface. As the building was being dismantled from north to south, clean wood would be transferred to a preparation zone in the center of the building footprint, “dirty” wood was sent to the north end of the footprint to be cleaned of contaminants (mostly roofing materials) with skid steers, metals were stored in roll-off containers on the floor for off-site shipment, and brick walls were dismantled and stockpiled in windrows outside the building footprint so as not to contaminate any of the other materials. Processing of the various material streams on the ground was constant. Wood was initially downsized, then fed by a material handler into a two-stage shredding system with magnetic separation at three places along the way. This product was then screened and stockpiled as a finished bio-fuel feedstock, meeting C-1 specification (see attached Wood Specifications), in an appropriate place on site. Clean concrete and masonry was crushed to a 2” minus backfill and installed in a continuous system behind the crushing operations. Finding a home for the processed wood-fuel product proved to be a challenge and an education in the particularities of the biomass industry. The majority of C&D derived biomass fuel is produced in stand-alone plants with built-in handling and processing stations that are conducive to consistently producing replicable, high quality fuel. Boilers have rigid chemical and physical criteria needed to be met for each facility, a standard that was initially thought to be difficult to achieve on a demolition site, and consequently, never previously attempted. While there was considerable interest in our product from the start, it took weeks of effort to provide the end users of the product with the level of comfort they needed to purchase fuel manufactured in this unconventional way. In the Plymouth Cordage Mill #2 Demolition project, we were able to achieve three goals: find an alternative to disposal for a large quantity of antique lumber that was unsuitable for salvage; manufacture a boiler-ready demolition debris-derived wood fuel project in the field rather than in a specialized facility; and incorporate these two directives into an over-arching project philosophy that met the budgetary needs of the project while maximizing recycling rates. We greatly benefited on this project from an owner who was supportive and understanding of the recycling goals, their place in the overall project project finances, and who granted us the luxury of space and time to meet our mutual goals. Overall, we manufactured over 3,000 tons of C& D derived biomass fuel, salvaged another 4,500 tons of antique lumber, and crushed 20,000 tons of brick and concrete for use as on-site fill. Less than 1% of the total weight of the project was sent to landfills for disposal. Nearly 600 tons of steel was salvaged, as well. Interestingly, this figure is approximately one pound per square foot higher than we typically expect to find in a building of this type, and it can almost certainly be attributed to the extensive use of magnets during material processing. In our opinion, this project demonstrated techniques that go far beyond simple recycling or diversion from landfill by using the demolition site as a fertile field to harvest raw materials and manufacture valuable products.